Aim: Guidelines for the management of patients with chronic heart failure have undergone change in recent years, with â-blockers and spironolactone shown to reduce mortality when added to angiotensin converting enzyme (ACE) inhibitors, diuretics and digoxin. The aim of this study was to examine the therapeutic management of heart failure in patients admitted to Tasmania's three major public hospitals, with an assessment of the appropriateness of the therapy according to contemporary published guidelines. 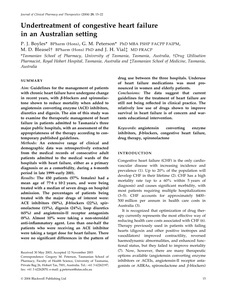 Methods: An extensive range of clinical and demographic data was retrospectively extracted from the medical records of consecutive adult patients admitted to the medical wards of the hospitals with heart failure, either as a primary diagnosis or as a comorbidity, during a 6-month period in late 1999–early 2001. Results: The 450 patients (57% females) had a mean age of 77·8 ± 10·2 years, and were being treated with a median of seven drugs on hospital admission. The percentages of patients being treated with the major drugs of interest were: ACE inhibitors (50%), â-blockers (22%), spironolactone (15%), digoxin (24%), loop diuretics (65%) and angiotensin-II receptor antagonists (8%). Almost 10% were taking a non-steroidal anti-inflammatory agent. Less than one-half the patients who were receiving an ACE inhibitor were taking a target dose for heart failure. There were no significant differences in the pattern of drug use between the three hospitals. Underuse of heart failure medications was most pronounced in women and elderly patients. Conclusions: The data suggest that current guidelines for the treatment of heart failure are still not being reflected in clinical practice. The relatively low use of drugs shown to improve survival in heart failure is of concern and warrants educational intervention.